Apple stock slumped near the close of trading, dragging down the Nasdaq and killing any hopes for a green close, after the company told the US government that the proposed tariff list covers a wide range of Apple products and the products used in the company’s U.S. operations. "Our concern with these tariffs is that the U.S. will be hardest hit, and that will result in lower U.S. growth and competitiveness and higher prices for U.S. consumers," the company said in a letter to the U.S. government. The list includes Apple digital health and wireless connectivity products, including Apple Watch, Apple Pencil and Air Pods; Apple computing tools such as MacMini; Apple adapters, cables and chargers engineered for efficiency and safety; Apple- designed components and made-to-specification tooling for Apple’s U.S. manufacturing and product repair facilities; specialty testing equipment for Apple’s U.S. product development labs; and servers, hard drives and cables for Apple’s U.S. data centers that support our global services such as the App Store, it said. 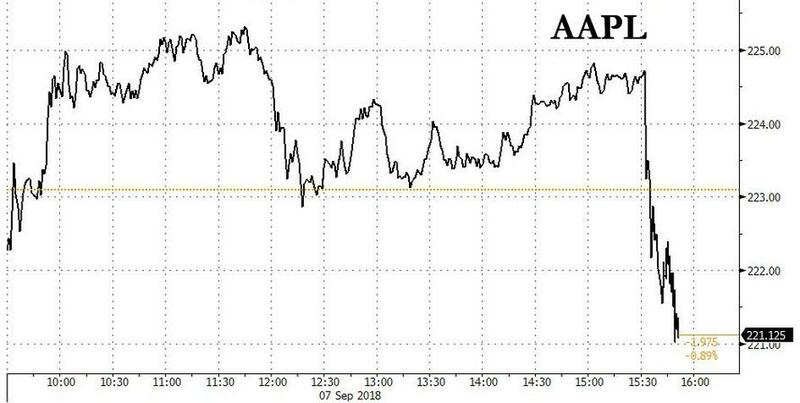 While hardly material for AAPL's $1 trillion + market cap, the sharp drop in AAPL stock which wiped out over $10 billion in market cap, shows that should Trump continue to push China and more companies are caught in the net, not even the untouchable tech sector would be spared, a scary preposition for the S&P500, in which over half the gains have come from just six tech stocks, with AAPL among them.